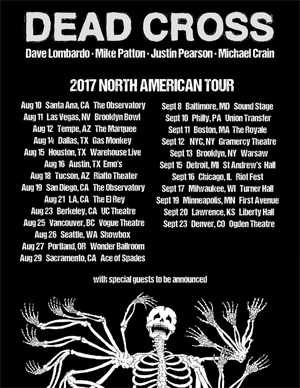 “Everything about DEAD CROSS screams aggression," said Lombardo. “I have no idea what kind of chaos it will conjure on stage or in the audience... but I know it's going to be a hell of a good time. Really looking forward to hitting the road with these guys." Hear the track "Grave Slave" below. The band recently gave fans an early preview of the band’s self-titled album, set for an Aug. 4 release via Ipecac Recordings, with the song “Grave Slave”. Rolling Stone, who spoke with both Patton and Lombardo about the new venture, said the album features “10 charging, head-spinning ragers.” Pre-orders, both digital and physical, are available now: http://smarturl.it/DxCx. Both the CD and vinyl versions feature glow-in-the-dark packaging, with vinyl available in clear/red/black swirl and a limited edition metallic gold.